As a leader you’re really only as good as your last decision. Furthermore, as Dave Girouard, CEO of personal finance startup Upstart said: "All business activity really comes down to two simple things: making decisions and executing on decisions. Your success depends on your ability to develop speed as a habit in both." Nevertheless, making decisions is a complex process that requires a lot of input and energy. So, what are the frameworks that could help you not only make quick, but better decisions as a manager? Before going into that, I would like to show you one of the easiest techniques out there. When Girouard worked with Larry Page, Eric Schmidt and Sergey Brin at Google, he learned an important lesson. The first step to decision-making process is to begin by calculating the time and effort each decision is worth, who needs to have input, and when you’ll arrive at an answer. According to Girouard, Eric Schmidt always made sure that decisions were made on a specific timeframe – a realistic one – but a firm one. I'm not sure if the guys at Google used this exact technique, but the Harvard Business Review Guide's worth-your-time test is one of the easiest and quickest way to make decisions. Am I the right person? If the problem or request fails the test – if the answer to any of these questions is “no” – then don't do it. Pass it to someone else (the right person), schedule it for another time (the right time), or wait until you have the information you need (either you or someone else needs to get it). That was pretty easy, right? I love these 3 questions, I use it myself and it is perfect for making quick decisions. 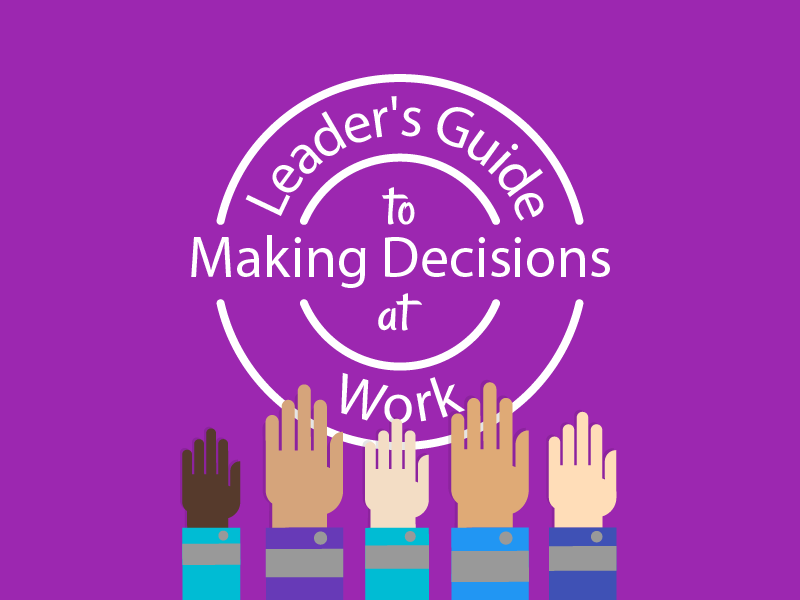 What goes into the decision-making process? Although, the worth-your-time test is easy and quick, sometimes the decision-making process is more complex than that. And Mike Myatt, leadership advisor and Forbes Leadership columnist, has broken the decision-making process into 6 metrics which will minimize the chances of making a bad decision. Perform a situation analysis: What is motivating the need for a decision? What would happen if no decision is made? Who will the decision impact? Subject your Decision to Public Scrutiny: If your decision were printed on the front page of the newspaper how would you feel? Have you sought counsel and/or feedback before making your decision? Assess the Risk/Reward Ratio: What are all the possible rewards, and when contrasted with all the potential risks? Assess Whether it is the Right Thing To Do: Standing behind decisions that everyone supports doesn’t particularly require a lot of chutzpah. On the other hand, standing behind what one believes is the right decision in the face of tremendous controversy is the stuff great leaders are made of. Always have a back-up plan: The real test of a leader is what happens in the moments following the realization they’ve made the wrong decision. Smart leaders always have a contingency plan knowing circumstances can sometimes fall beyond the boundaries of reason or control – no “Plan B” equals a flawed plan. Now that you are equipped with the vital techniques of making right decisions quickly, it is time to test what you learned. As a team-building event, I and the Weekdone team built a fun Manager Simulator game within a 20 hour hackathon. We ended up with a Simulator where everyone can test their different management skills and decision-making was one of them. If you have any doubts whether to try it or not, let's run it through the worth-your-time test. 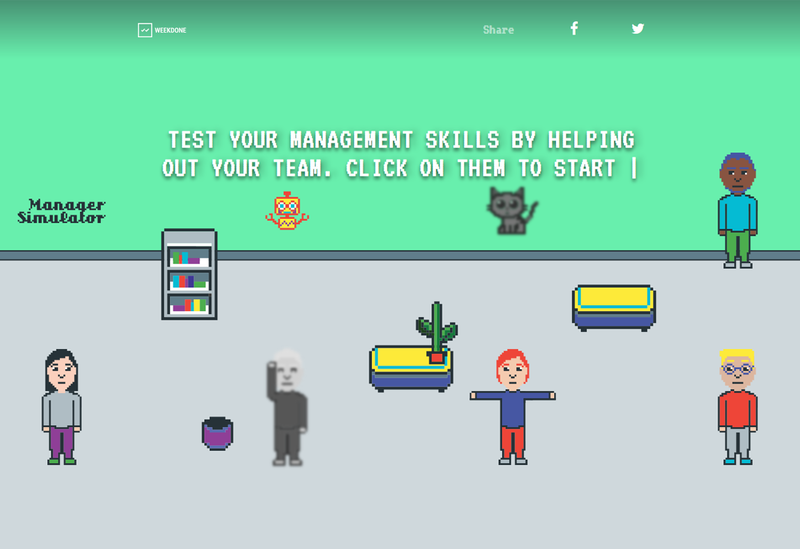 Should you test your management skills in a fun Manager Simulator game? Am I the right person? YES, you were interested how leaders make quick decisions, therefore you should be interested in other skills as well. Most of all, it's fun. Is this the right time? YES, the key is in not spending time, but in investing it. Do I have enough information? YES, In a manager simulator you can test your skills by making quick decisions, motivating, delegating and more. Remember to follow us on Twitter, Google+ and Facebook for all about testing, management, leadership and more!